America’s trade deficit with China, in 2017 alone, was $375 billion. That’s a gap of over $31 billion a month – or $1 billion a day. We believe having a better grasp on what money is will bring clarity to the nasty trade deficit that’s motivating today’s burgeoning trade war. With respect to our initial inquiry we turn to Victorian economist William Stanley Jevons for edification. In his 1875 work, Money and the Mechanism of Exchange, Jevons stated that money has four functions. It’s a medium of exchange, a common measure of value, a standard of value, and a store of value. Many deficiencies with today’s renditions of money, including the dollar, appear when applying these functions to the present system of floating exchange rates. With the exception of functioning as a medium of exchange, the dollar, like all of today’s debt based fiat currencies, comes up short in its function as a common measure of value, a standard of value, and a store of value. Hence, today’s money is not real money. Rather, it’s fake money. What’s more, this fake money has ridiculous implications on how people earn, save, invest, and pay their way in the world we live in. Practically all aspects of everything have been disfigured by it. The failings of today’s fake money generally stem from the unsatisfactory reality that it is birthed from debt. Money is borrowed into existence seemingly without limits. On top of that, floating exchange rates, where the relationships between currencies are ever changing, and money is continually eroded by monetary inflation, make it wanting as a common measure of value, a standard of value, and a store of value. Take the dollar, for instance. Over the last 100-years, it has lost over 95-percent of its value. Yet, even with this poor performance, the dollar has one of the better track records going. In fact, many currencies that were around just a short century ago have vanished from the face of the earth. They have been debased to their actual value – that of fire kindling or toilet paper. 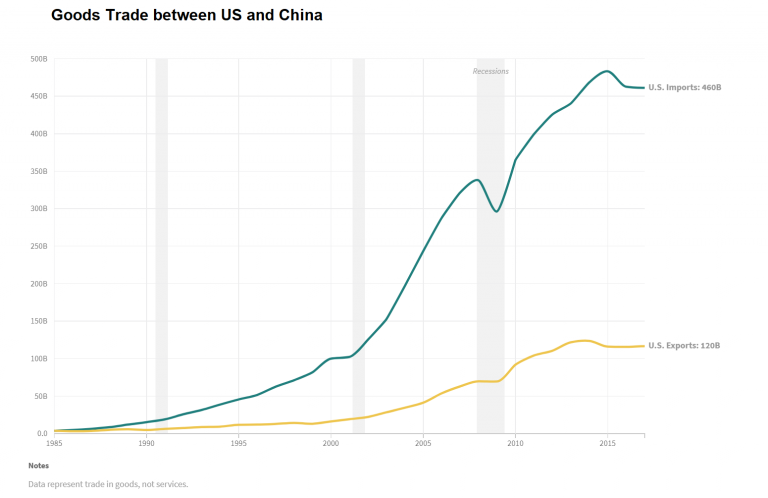 So how’s it possible for America’s trade deficit with China to be so gargantuan? By following the fake money, some semblance of an answer comes into focus. The U.S.Treasury borrows money into existence via budget deficits. Similarly, commercial banks borrow money into existence via fractional reserve banking. The Federal Reserve encourages the over issuance of credit by artificially suppressing interest rates for extended time periods – often a decade or more. 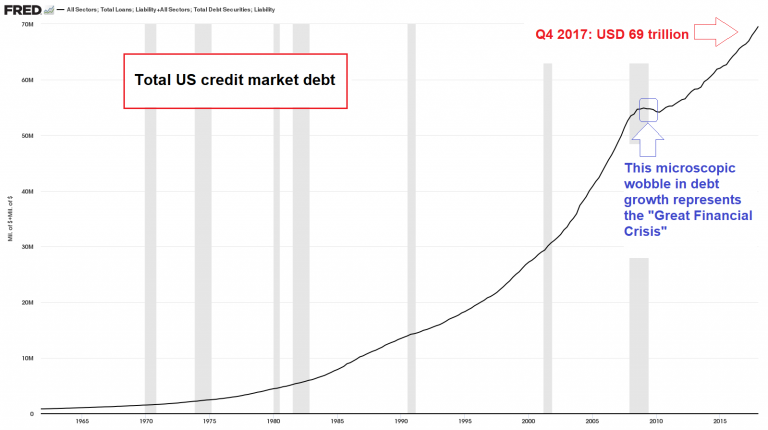 This continuous flood of credit – the flip-side of debt – finds its way into stocks, real estate, and foreign made imported goods. Some of it even finds its way into the absurdity of 75-inch flat screen televisions. Surplus trading partners, like China, then recycle the dollars back into U.S. Treasuries, thus, perpetuating greater debt creation – and an ever expanding trade deficit. The trade deficit, you see, is a function of fake money and expansive fiscal and monetary policy. Without fake money, the trade deficit never could have blown out to today’s extreme imbalance. 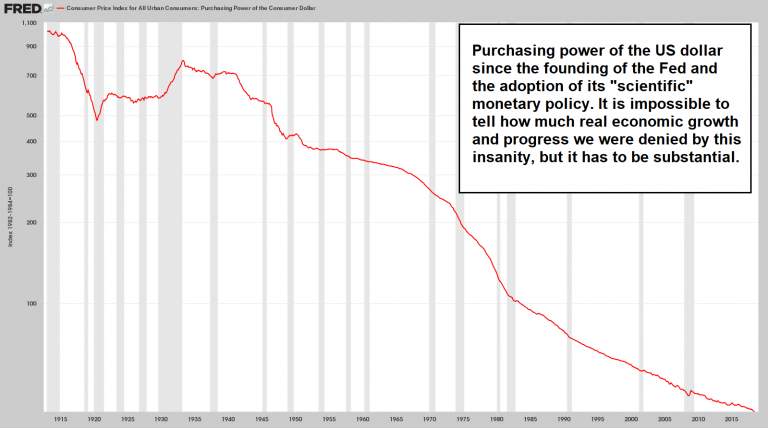 Unfortunately, the economy is so dependent upon ever expanding debt that all it takes is a minor pause – like in 2008 – and the whole edifice is at risk of crashing down. Readers frequently write us to point out the dollar’s unique role as the world’s reserve currency. They highlight the need for massive quantities of dollars to provide a medium of exchange for global trade. Readers are also quick to bring up something called Triffin’s dilemma and reproach us for not mentioning it. 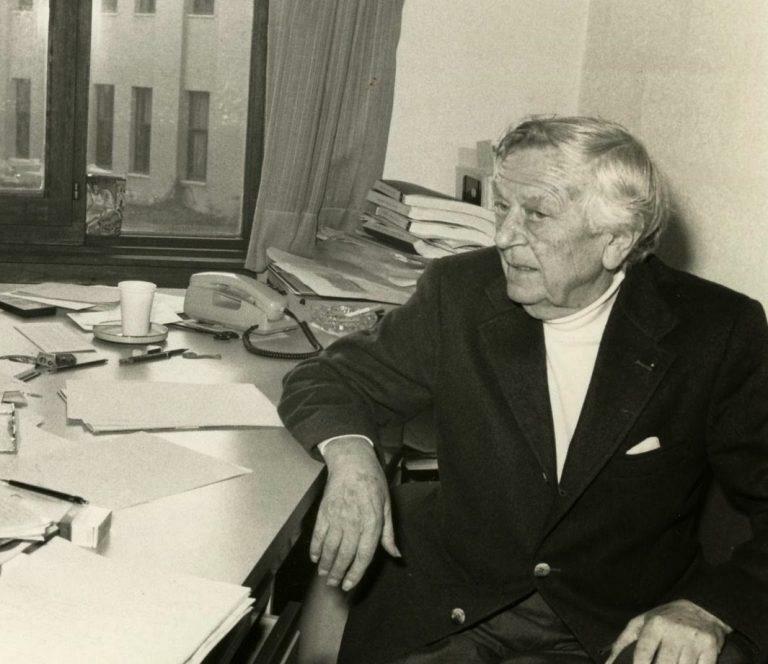 According to an insight elaborated by Belgian-American economist Robert Triffin some 50 years ago, the U.S., as bearer of the world reserve currency, must supply the world with an abundance of dollar reserves. But, as a consequence, the U.S. must run a trade deficit. Specifically, by having the world reserve currency, the U.S. must import more than it exports. It must spend more than it earns. In other words, it must eventually go broke. Hence, the dilemma. Is Triffin’s dilemma a fact? We don’t know. But perhaps the mere mention of it inflates our IQ. What we do know is that readers who write to admonish our failure to mention Triffin’s dilemma are also swift to use the term ‘exorbitant privilege’ to describe the unique advantage the U.S. has as issuer of the world reserve currency. They even supply lengthy and convoluted arguments pleading their case. As far as we can follow, this exorbitant privilege affords the U.S. the unique opportunity to create money from nothing and trade it to foreign countries in exchange for real stuff. Somehow, according to this theory, the trade deficit can expand without limits forever and ever – and without consequence. This all sounds great – like having cake and then eating it too. Nonetheless, we remain unconvinced. There’s an itch of suspicion we can’t quite satisfy. Something tells us that fake money yields fake theories that attempt to offer some sort of academic justification for an economic cancer. Moreover, we believe the jury’s still out on the eternal pre-eminence of the dollar. Fake money requires an inordinate amount of misplaced confidence to perpetuate its charade. But confidence in the dollar, like Hollywood star power, can quickly fall out of favor. Be it a trade war, a currency war, a fighting war, or the mass realization that the Federal Reserve’s painted itself into a corner and has lost their ability to combat an episode of extreme inflation or deflation of its making – confidence in today’s fake money will wane. It’s already happening. 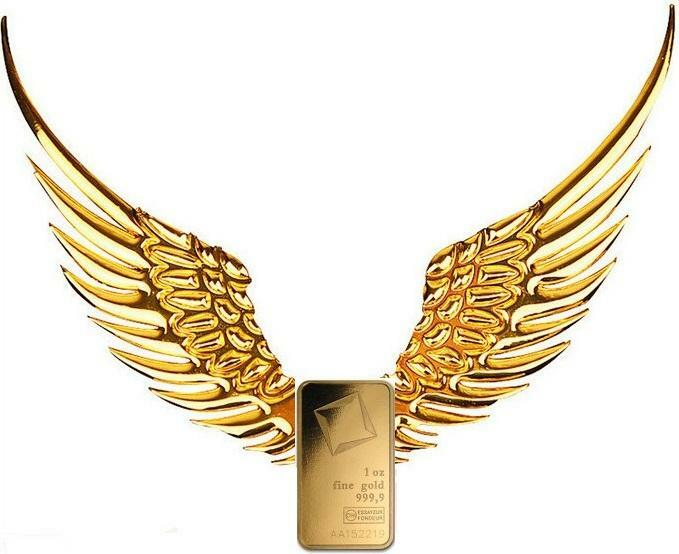 Real money, the money of last resort, and the type of money that fulfills the four functions of money identified by Jevons, is physical gold. Readers, whether they believe it or not, would be remiss not to hoard a little gold – or silver – bullion as we journey from summer into fall. There’s doom and gloom out there, just yonder the horizon. 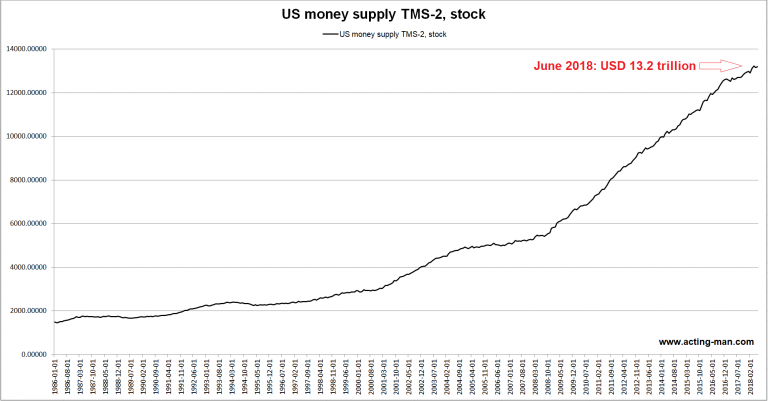 The time to prepare for the end of fake money is now.